INTI students benefit from an education that empowers them with the right skills and attributes to excel at whatever they do, wherever they go. A unique advantage derived from the Three I’s of International Exposure, Innovative Learning and Individual Development helps them to expand their global perspectives, think critically, and realise their aspirations in a world of constant change. INTI’s Three I’s ensure that students are empowered for global success. International exposure is an important component in INTI’s innovation-driven, global-oriented and career-focused approach to education. International case studies are part of the curriculum, with a minimum of one case study per course per semester. Students also experience new cultures and meet global peers through faculty study tours to countries such as Korea, China, Australia and Thailand. Their world perspective is further broadened via cross cultural case discussion with students from other parts of the world via live video conference in the classroom. 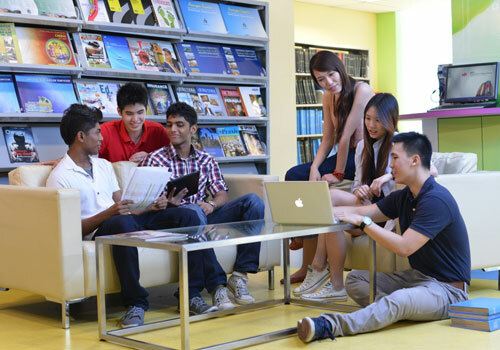 “Our students have had the opportunity to interact directly with their counterparts in other countries, such as in case studies on the application of e-commerce by Yunnan Lucky Air with students of Stamford International University in Thailand, and on Apple Inc.’s success with students of Universidad del Valle de Mexico. The sessions were not only informative but also thought provoking and inspiring for the participants who gained new insight into the world of international business,” said Professor Dr Allan Fisher, Interim Vice Chancellor of INTI International University. Aside from lectures, many initiatives are in place to help INTI’s students build up competencies through innovative learning. Since 2011 INTI’s students have successfully engaged in and completed a total of 180 innovative projects with 125 employers from various industries. Real employer projects ranging from “Ways of doing business and how to setup a company in Myanmar” to “Development of a research book that identifies the changes shaping Malaysia’s marketing landscape and consumer behavior trends” were introduced in the classroom to help students develop problem solving, collaboration, communication and critical thinking skills. “INTI offers a blended learning approach incorporating lectures and innovative technologies that include online tools, multimedia content and Blackboard’s learning system. Innovation brings multiple industry projects that enable students to work with employers on real business issues and solutions to gain experience and readiness for global employability. It includes structured internships with established companies where students work on specific projects for a period of three months and learn to be resourceful, efficient and engaging,” said Professor Dr. Fisher. To bring out a student’s full potential, individual development is emphasized at INTI and this involves the student’s journey of transformation to become a competent graduate via a self-discovery and development plan using personality assessment tools, industry talks, and career camps. Students build self-confidence and communication skills via specially-developed General Education modules. Individual development also involves coaching and mentorship programmes, grooming workshops, and on campus recruitment which has seen many students offered jobs by top employers. For more information on INTI programmes, call 03-5623 2800 / 06-798 2000 / 03-2052 2888 / 04-631 0138.